This navigation camera image taken by the Mars Exploration Rover Opportunity on the 36th martian day, or sol, of its mission (March 1, 2004) shows the layered rocks of the "El Capitan" area near the rover's landing site at Meridani Planum, Mars. Visible on two of the rocks are the holes drilled by the rover, which provided scientists with a window to this part of the red planet's water-soaked past. Scientists used the rover's microscopic imager and two spectrometers to look at the details of the freshly exposed, clean surfaces created by the rover's rock abrasion tool. Seeing beyond the veil of dust and coatings on the surface of the rock, scientists obtained the best views of the chemical composition of the areas. These data indicated that the rocks are made up of types of sulfate that could have only been created by interaction between water and martian rock. The chemical make-up of the two holes is slightly different, giving scientists an inkling into the geologic history of this area. This history may help to explain the origin of the granular hematite found around the small crater cradling Opportunity and the "El Capitan" rock region. 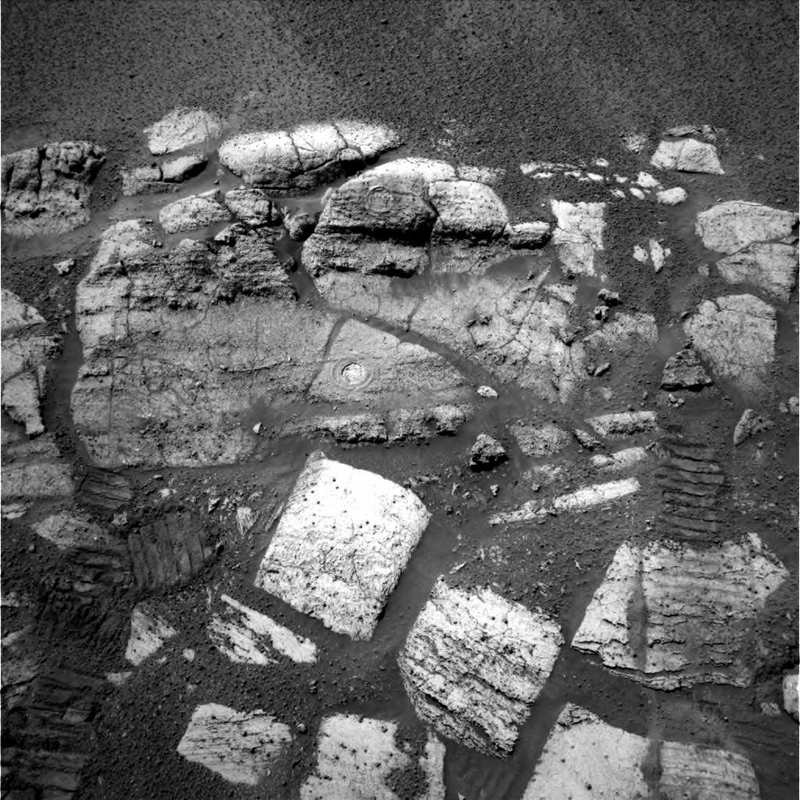 The sulfates and the other chemicals found in the rocks at this location on Mars also occur on Earth, but only rarely. In places like Rio Tinto, Spain, similar minerals are forming today, and microorganisms live and thrive there. Analyzing these two clean surfaces created by the rock abrasion tool proves that Mars had interactions between water and rock over extended amounts of time. Life on Earth is sustained by extended interaction between water and the environment. The fact that scientists have now found evidence of a similar relationship between water and rock on Mars does not necessarily mean that life did develop on Mars, but it does bring the possibility one step closer to reality. Opportunity's wheel tracks can be seen at the bottom left and right sides of this image. The tracks extend to the center of the image, indicating where Opportunity sat when it analyzed the rocks with the instruments on its robotic arm.